I will admit that I am no fan of the gamut of early to mid-19th century Western literature. I know it’s a sweeping generalization. But there’s something about the pre-Victorian and Victorian novelists that I just find grating. The novel was a novel concept at the time, sweeping the civilized world. Love stories mixed with polite social satire reigned supreme. But to me, it all seems like the imaginings of an overemotional teenager. There’s a reason why Jane Austen‘s “Emma” works so well in its “Clueless” incarnation. Louisa May Alcott’s Little Women would easily serve as a parody of this type of literature if it didn’t take itself so seriously. It’s got all the conventions: A young woman with a big dream, strange love affairs, an expansive world that magically seems to be populated with only the work’s characters. Is it really believable that two people in Concord are going to meet up in Italy? Mind you this is without the luxury of cell phones and GPS tracking devices. In any case, these are flaws with the story, which NightBlue Theater has no control over. Nor does the company have much say in the rather uninspiring songs in the novel’s staged musical version. Still, the decision to produce a play that’s as interesting as sandpaper does fall on NightBlue’s head. Little Women really is a drama without much drama. Young girls grow into women, people fall in love and someone dies of scarlet fever. And the fact that it takes nearly two-and-a-half hours for NightBlue to tell this story only adds to the complete lack of dramatic tension. The story of Little Women concerns the March sisters. The protagonist is Jo (Erin O’Shea), a precocious and peppy young woman with big New York dreams. She pens stories of swashbucklers and bloodshed in the hopes of attracting the attention of the popular magazines. 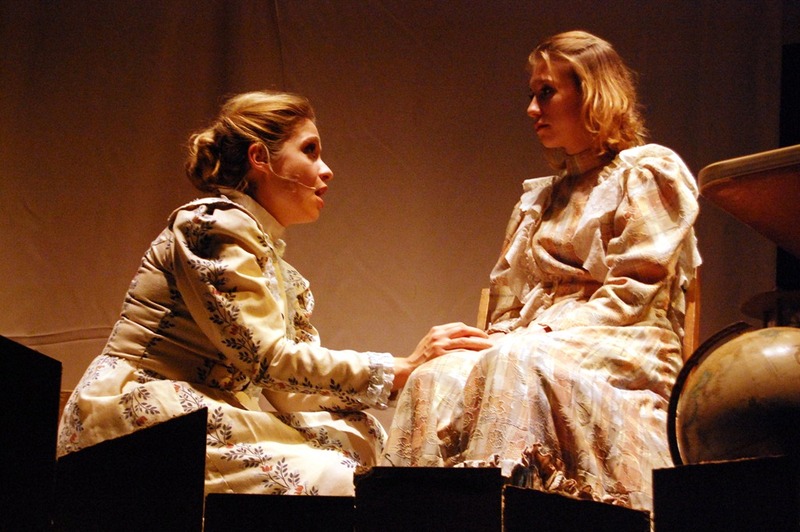 Jo has three sisters: Beth (Julia Macholl), Meg (Karyn Dawidowicz) and Amy. The most notable of Jo’s sisters is Amy, played by Linda Rudy, who serves as Jo’s adversary. Jealous of Jo’s beauty and blossoming womanhood, Amy attempts to thwart Jo at every turn, particularly when she tosses one of Jo’s literary works into the fire. The neighbor boy, Laurie (Shaun Nathan Baer), befriends the girls and quickly falls in love with Jo. When he collects the courage to propose, Jo rejects him. Although it breaks his heart, he eventually finds love elsewhere. NightBlue is billing the production as a Christmas play. And although the holiday does serve as an occasional backdrop, it’s a bit of a stretch to say Little Women is up there with Miracle on 34th Street (which is coincidentally also up at Stage 773). I also think that their target audience of little girls (they were raffling off a chance to win an American Girl doll the night I went) is a bit of a misfire. Even with musical interludes to break up the monotony of the story, the play drags too long for a child’s attention span. Director Paul E. Packer could omit some scenes and no one would object. All this said, accolades must be paid to two of the play’s standout performers. O’Shea is put through an endurance test, singing in nearly half of the play’s pieces. She displays her talent as both a superb vocalist and a convincing actress. Rudy is exceptionally irritating as Amy, which I intend as a compliment given that Amy is supposed to be exceptionally irritating. Rudy adds genuineness to Amy’s huffy, pouty demeanor without crossing over into caricature. You know the antagonist does a good job when you find yourself wanting to reprimand her from your seat. 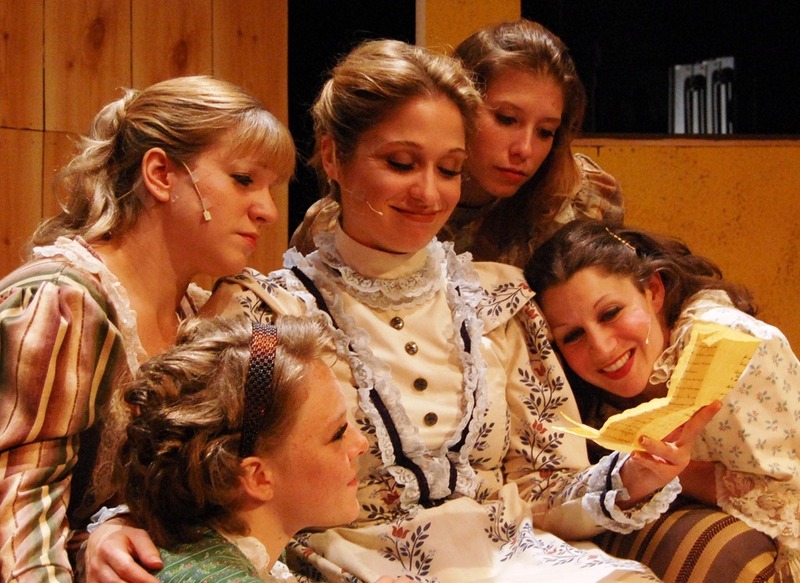 If you’re a huge Louisa May Alcott fan, you may enjoy this musical version of Little Women. Otherwise, the slow pacing and tame story may just lull you into hibernation. Rent – the 1996 rock opera about eight friends struggling to get by in New York’s Lower East Side neighborhood – find’s it’s power in its incredible music. It is the rock solid songs, packed with raw emotion and romantic tragedy that have kept Rent a musical favorite for the last fourteen years. Its success has sparked fascination with its edgy subject matter and the tragic story of its creator, who did not live to see the massive success of his magnum opus. 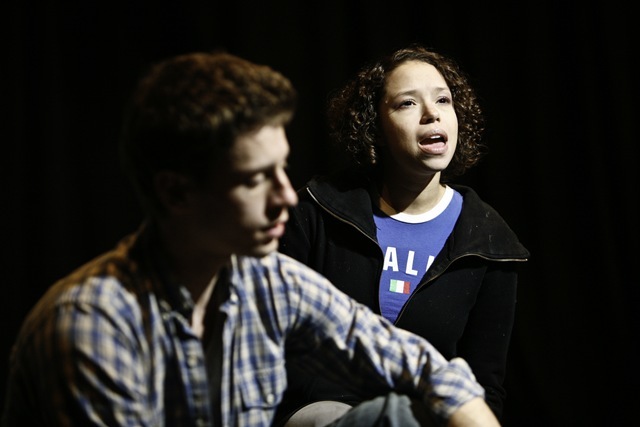 Jonathan Larson, Rent’s author, died of an aortic aneurism the night before its first preview, giving haunting poignancy to the show, whose central message is to revel in the joy of life in the present, because no one knows what the future holds. 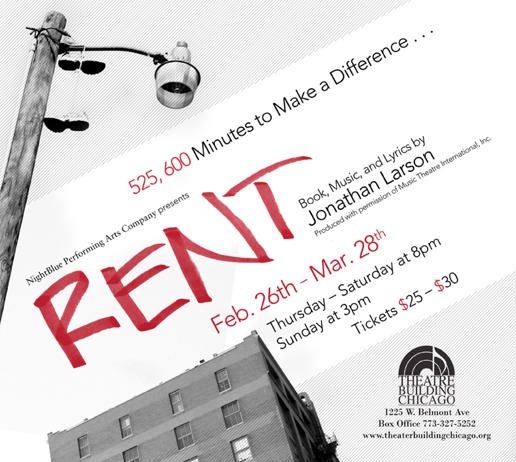 For many of Rent’s characters, the future looks challenging: AIDS, homelessness, poverty and gender issues are all major themes in this groundbreaking musical. The question for Rent now is, is it timeless? Will this musical endure as we trudge farther and farther away from the 1990’s? The answer remains to be seen: Rent is less than twenty years old, and it’s hot button issues of HIV/AIDS, homelessness and sexual liberty are as provocative in 2010 as they were when the musical opened. But with it’s decade specific soundtrack and aesthetic, it needs open minded theater-makers to keep it from becoming “Rent: The Totally 90’s Musical!” It needs companies like NightBlue, whose production of the show is respectful without being tied to the famous original production. NightBlue’s Rent is “Rent for 2010”. From it’s paired down set consisting only of a wooden loft and a pay phone, to it’s young, amazingly natural performers, this production looks back from the other side of the millennium, without forgetting how we live now. It’s not common to see performances one would classify as “natural” in musical theater, but the young actors in Rent have taken NightBlue’s mission of “performing naked” to heart (not literally). Especially during Roger’s (played here by perfectly cast Chris Froseth) Act One aria in which he dreams of finding “Glory”, by writing one great song before dying of AIDS. In this version, Roger sits alone and accompanies himself on acoustic guitar, and the effect is powerful and sentimental, void of the uber-90’s power-ballad vibe that plagues the original cast recording. Jonathan Hymen has a laid back, best friend quality that makes him a great pick for Mark, the eyes through which the audience meets the cast of characters. Hymen is especially good during the first act, when Mark’s fun, youthful demeanor is nicely showcased with songs “Rent” and “Tango: Maureen,” a duet with smart actress Whitney White, who’s Joanne is driven and sassy without being overbearing. Playing her love interest, Maureen is the lovely Diane Mair, whose classy version of “Over The Moon” gives depth to a silly song. Act one closer “La Vie Boheme,” misses the mark here, unfortunately. Awkward, cluttered choreography diminishes the impact of this boisterous ode to the life of the artist. Rent has a special meaning in 2010. Healthcare worries, matched with the economic downfall make this musical about extreme poverty and AIDS intriguing. Sadly, Johnathan Larson isn’t here to create new works based upon the current crises; we have to rely on responsible theaters like NightBlue to protect the work he did create. Luckily, co-directors Brian LaDuca and David E. Walters have the sense and talent to protect Rent by making it their own, and thus, making it relevant.